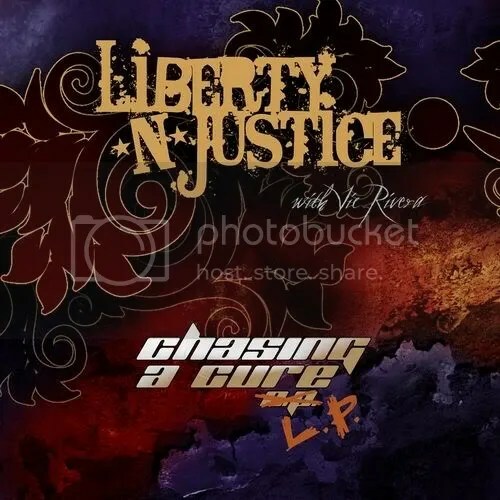 Liberty N’ Justice is a Christian hard rock band that began in the early 1990s and has shifted into more of a melodic rock project in recent times. I say “project” because each LNJ release now features a variety of guest musicians with the only constant being founding member Justin Murr. This particular release was originally an EP and was a digital download only. It was done to help raise money for The Epilepsy Foundation and help raise awareness about epilepsy. I guess the project was enough of a success that a physical pressing of the album was produced with 8 “bonus” tracks turning Chasing a Cure into a full-length album. I’d been aware of LNJ for a number of years but was always surprised at how low-key the hype around the releases seemed to be considering the talent that was involved. This a truly all-star outfit as Lou Gramm, Phil Collen, Sebastian Bach, Chris Jericho, Michael Sweet, Jack Russell, Stephen Pearcy, Phil Lewis, Jamie St. James, Robert Mason and Jani Lane (yes — all THREE Warrant vocalists) have all appeared on various albums. On this release alone Paul Shortino, Ron Keel, Donnie Vie, Carmine Appice, Eddie Ojeda, Bill Leverty and Kerry Livgren all pitch in alongside members of XYZ, King Kobra, Baton Rouge and various other Christian rock bands. Let me put this out there — despite some of the names I mentioned, this is most definitely a melodic rock album. I’m talking “Why didn’t Frontiers release this?” melodic. So for me, a few songs fall short. A few are too slow or too polished for my tastes but this is still a solid release overall. The only song I truly cannot stand is “Snake Eat Snake” which sounds like something from the grunge era and is so bad I’m wondering if it’s meant as a joke! The hardest rocking song on the album is “Butterface”, which is pretty modern and kinda reminds me of Velvet Revolver. “Ground Zero” reminds me of Kansas which is no surprise with Livgren participating on this track. A couple of good cover songs are thrown in on the bonus portion of the album. XYZ’s Terry Ilous does a great job on Michael Jackson’s “Black Or White” and Baton Rouge’s Kelly Keeling is truly impressive on Skid Row’s “Quicksand Jesus”. No offense to the rest of the album but it is this take on “Quicksand Jesus” that I have listened to most (but to be fair, it is one of my favorite Skid Row songs). Frequent MelodicRock.com visitors will probably get much more mileage out of this album than I have but I still liked it a lot and the money goes towards a good cause so go buy it!